Today, in Rome, I was finishing some things on my to-do list, and planned on leaving tomorrow for Bologna. My plan was to take the bus up north, as research for a future blog post, but as I was investigating the bus timetables, an advertisement caught my eye. The ad featured the new train system called Italo. The train is the first privately owned, and operated train system in Italy. The train is pioneered, designed, and built by Ferrari. The new service caught my eye and I couldn’t refuse the opportunity to ride. To be completely honest with you I’m writing this blog post while on the train. Here are the 6 reasons Italo is the best ticket in town, and why you should test drive. Luxury. The train is nice, very nice. Every seat is uniquely designed to provide each passenger with amenities unseen by any other train system in Italy. For those passengers who ride in the first class (Prima) food, coffee, and other services are provided. There is also free wifi, tv, and movies, onboard. Lastly, the train is very clean. The clean factor really does set Italo a part from the Trenitalia’s bullet train the Frecciarossa. Comfort. Each seat is larger and gives each passenger more room. The train and seats absorb most of the shock from the railway lines. Result: leaving each passenger with a smooth and comfortable ride. Lastly, Italy passengers can enjoy the comfort of the Italo lounge at most, if not all, train stations. Design. The train has a noteworthy designed. The same attention to detail expected from Ferrari is reflected in the train. Everything is clean, and is an expression of Italian modern design. Silence. The train is very quiet, and smooth. Even at our top speed of 300 kmh (or 186 mph) the “silence factor” is remarkable. Again, noticeably quiteter than the Frecciarossa – Italy’s other fast train. Convenience. The ticket purchasing process was the easiest experience I have ever had in Italy. I bought the tickets online, it took about 7 minutes, and the tickets were emailed to me immediately. The Italo team is strategically located throughout the train station and surprisingly egger to help. On the platform there are staff members directing people to the location of their train car while answering questions. Price. The most striking thing about Italo is the price. The base, or economy, tickets run between €20 – €25 each way. Business class tickets run about the same as the second class tickets on the Frecciarossa – about €45 each way. I wrote a blog post on the advantages of the Trenitalia’s Frecciarossa last year. Click here to view the blog post, The Cost of Train Tickets. The train is a great new way to get around Italy. 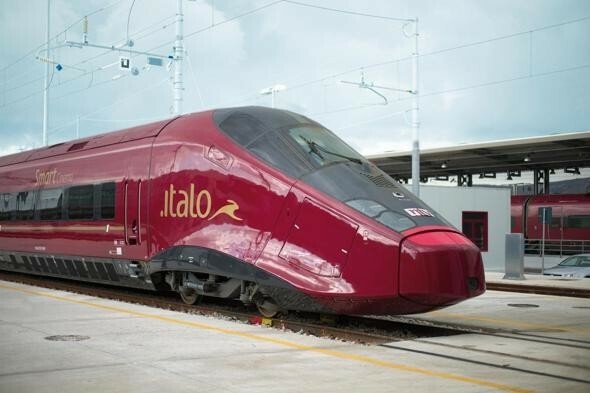 It will be there first high speed train system to reach Venice (no more Harry Potter trains). In the back of my mind, I wonder if Italo can keep their service, and amenities fresh with consistency. Only time will tell. However, I bet it will be the new standard in Italian railway travel. The call to action, you must take it for a test-drive!